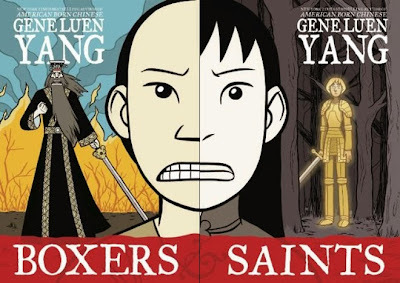 I am extremely pleased to be bringing you an e-mail interview I conducted a little while ago with Gene Luen Yang, whose most recent graphic novels look at two sides of the Boxer Revolution, Boxers and Saints. Yang has an incredible reputation outside of the superhero echo chamber, both for the quality of his work (which includes American Born Chinese, The Eternal Smile, and work on comic versions of Avatar: The Last Airbender) and because he broke the glass ceiling for comics and was the first creator ever nominated for a National Book Award. Now he's nominated again, which is no small feat in and of itself, but keep in mind that Yang's second nod is only the third time a comics creator has been nominated, period. Panel Patter: For those unfamiliar with your work, tell them a little bit about yourself. Gene Luen Yang: Hi! Thanks so much for taking the time to do this interview. My name is Gene Luen Yang and I make comic books. My most well-known work is a graphic novel called American Born Chinese, which was released by First Second Books in 2006. It was nominated for a National Book Award. It also won an Eisner Award and a Michael L. Printz Award. I've done a number of books since, including Boxers & Saints, two graphic novels about the Boxer Rebellion. Boxers & Saints was recently longlisted for the National Book Award. In addition to my creator-owned work, I write for Dark Horse Comics' Avatar: The Last Airbender series. We're continuing from where the hugely popular Nickelodeon show left off. Panel Patter: Who do you consider your creative influences? Yang: I'm heavily influenced by animation. When I was a kid, I dreamed of being a Disney animator. I spent hours practicing drawing in that classic Disney style, and I think some of that still shows through in my work. I was also influenced by Bruce Timm's work in the DC Animated universe. He and Paul Dini started the Batman animated series when I was in college. I found it mind-blowing. I also admire the work of Osamu Tezuka, Jeff Smith, Lynda Barry, Adrian Tomine, Peter David. I don't think I'd be in comics at all if I hadn't read Scott McCloud's Understanding Comics. When I started in the industry, I hung out with a group of Bay Area cartoonists that included Derek Kirk Kim, Lark Pien, Jason Shiga, Jesse Hamm, Jason Thompson, Ben Catmull, Jesse Reklaw, Thien Pham. We used to get together once a week to draw together, talk shop, and critique one another's work. I never went to art school, so that was like art school for me. I learned how to think about comics storytelling from those guys. Panel Patter: That's an impressive list, and you named quite a few of my favorites as well. How does it feel to be not only the first comics creator to be a National Book Award nominee, but to be only the third overall to do it? Yang: It's pretty crazy. I feel incredibly fortunate. Over the last several years, the comic book and tradition book markets have been slowly merging. Art Spiegelman's Maus, Marjane Satrapi's Persepolis, Craig Thompson's Blankets, Watchmen, Neil Gaiman's stuff -- all these beautiful, quality comics have forced the traditional prose establishment to sit up and take notice. They created a category in people's minds for literary graphic novels. I've been a beneficiary of that. Panel Patter: Why do you think so few graphic novels have been nominated for the National Book Award? Yang: The category that I was nominated in, Young People's Literature, has always included both prose novels and picture books. There's always been that visual element, so graphic novels are a natural fit. There have been many nominees that sit in between formats. For instance, you could argue that Brian Selznick's The Invention of Hugo Cabret is half graphic novel, half prose novel. One of the other nominees this year, Flora and Ulysses by the extraordinary Kate DiCamillo, is a prose novel that incorporates comics. As comics publishers and literary awards committees become more aware of one another, I expect the number of graphic novel nominees and winners to increase. Panel Patter: Tell readers a little bit about Boxers and Saints. How would you describe it to someone? Yang: My publisher likes to use the word "diptych" to describe Boxers & Saints, even though I had no idea what a "diptych" was until they started using it. 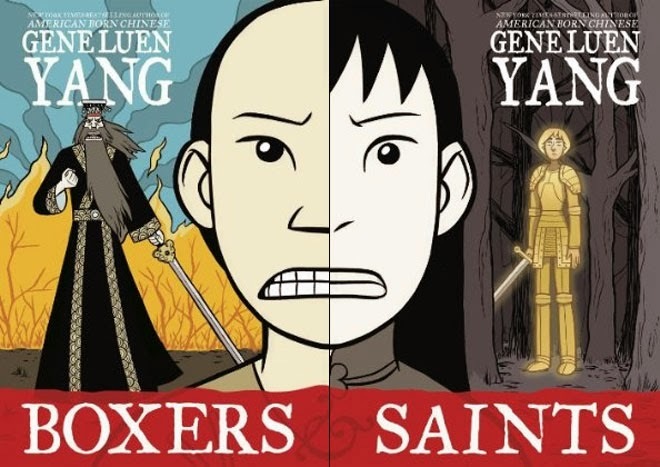 Boxers & Saints is a set of two graphic novels about the Boxer Rebellion, a war that was fought on Chinese soil in the year 1900. European soldiers, European missionaries, and Chinese Christians were on one side of the conflict. On the other was this army of poor, starving young men -- known as the Boxers -- who believed they could call the Chinese gods down from the skies and these Chinese gods would give them superpowers. The more I read about the Boxer Rebellion, the more fascinated I became. The historical event embodies this clash between cultures, between worldviews, that I've personally struggled with at different times in my life. Panel Patter: Why did you feel now was the time to tell this dual story about the Boxer Rebellion? Yang: We don't hear much about the Boxer Rebellion in America. It gets maybe a paragraph or two in your average American history text book. Even so, I think it's still incredibly relevant. First, there are a lot of parallels between the Boxer Rebellion and current events. The Boxers were these desperate teenagers, empowered by strange spiritual beliefs to defend their nation. They're a lot like the young men in the Middle East who join extremist movements. Second, the Boxer Rebellion and the events leading up to it in the 1800's still color China's relationship with the West. China refers to that period of time as their Century of Humiliation, and for good reason. Much of China's foreign policy today is about recovering from that century. I think that as China grows economically, as China and America's relationship develops, we'll be studying events like the Boxer Rebellion more and more in American classrooms. Panel Patter: Why did you break it down into two books instead of one graphic novel? Yang: It's two books because I couldn't decide who I sympathized with more, the Boxers or their Chinese Christian victims. I told the story from both points of view, so the protagonists in one book are the antagonists in the other. Panel Patter: If a person reads only Boxers or Saints, how will their experience with the material change versus a person who has read them together? Yang: My hope is that the books can be read separately and still be satisfying. I really tried hard to give each narrative a beginning, middle, and end. However, I also hope that readers who read both will get a little something extra from the dialog between the two. Panel Patter: The research work you did for these books definitely shows. How long did it take you to prepare working on them? Yang: I researched for maybe a year and a half. I went to my local university one night a week for about a year and read everything I could about the Boxer Rebellion. I also got the opportunity to visit a Jesuit archive in France, where they keep all these letters and photographs of turn-of-the-century French missionaries to China. Panel Patter: The themes of identity and religion play a big part in your graphic novels. How do your own experiences and faith influence your work? Yang: A friend of mine, a novelist named Marsha Qualey, likes to say that at the heart of Young Adult literature is this equation: Power + Belonging = Identity. Culture and religion are ways in which humans find power and belonging. That's certainly true in my own life. Both my cultural heritage and my faith tradition have been very important to me. They've helped me establish my identity and find my place in the world. There's a natural tension between the individual and the community. I think modern America tends to emphasize the individual over the community. Our ties to traditional cultures and faith communities can counteract that. Sometimes this is terrible, of course, but often, at least in my own life, it's good. It's always a struggle, though, and struggle is at the heart of every story. Because it's a struggle I've felt deeply at different points in my life, a lot of my stories are about that. Panel Patter: All faiths have their historical problems and you show some of the ones involved with Christian missionaries in China. What do you hope readers will learn from your depiction, particularly in Saints? Yang: This history of Eastern religion and Western faith is complex. At the time of the Boxer Rebellion, Western faith was often used as justification for all sorts of atrocities. If you were Chinese and a Christian, you were seen as someone who turned his back on his own culture. Now, just over a century later, Christianity is one of the fastest growing movements in China. By some estimates, there will soon be more Christians in China than members of the Chinese Communist Party. So how did we get from there to here? Many of those early Chinese converts to Christianity were outsiders. They had a hard time finding a place for themselves within mainstream Chinese culture, so they turned to the stories of the "other." They looked for reflections of themselves in Western religious stories. Christianity as a haven for the outsider -- that outlook as historical merit as well. As I said before, it's a complex relationship. I hope some of that complexity comes through in Saints. Panel Patter: It definitely does. 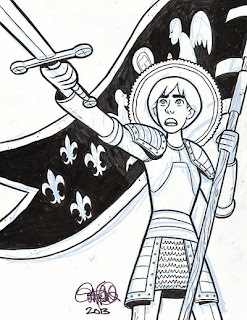 What inspired you to use Joan of Arc in Saints? Is she designed to echo the Opera Gods in Boxers? Yang: In my research, I was struck by how similar the Boxers were to Joan of Arc. Both were teenagers. Both were angry about this foreign presence in their homelands. Both turned to these strange mystical beliefs for power. Both fought for their countries, and both met tragic ends. So within the stories of the Boxers' enemies was this figure very much like themselves. I included Joan of Arc to draw out that parallel. Joan was essentially a French Boxer. Panel Patter: That's a great comparison! Lastly, what are you working on next that readers can look forward to? Yang: I'm really excited about my next project. It's a collaboration with Sonny Liew, a cartoonist wunderkind from Singapore. We're reviving an obscure 1940's American superhero called the Green Turtle. I'm writing, he's drawing. Our graphic novel is called The Shadow Hero, and First Second Books will release it in 2014. Panel Patter: Thanks again for doing this, Gene! Best of luck to you in the final round of the National Book Awards, and I hope to see many more award nominations (and wins!) in the future! 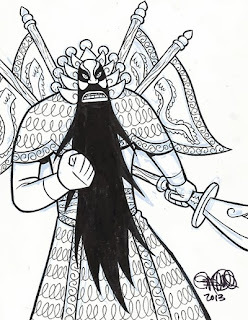 You can see more about Gene Luen Yang's work at his website. His graphic novels can be found at your local comic book shop, and trust me, they are pretty darned good.